By Kristin Kaupang, physical therapist at Harborview Medical Center. Presented on February 12, 2013, at the University of Washington Medical Center. There are so many barriers to getting exercise after you've had a spinal cord injury that it is easy to be discouraged or feel that it is impossible. But regular physical activity is important for staying healthy and feeling good, especially if you have an SCI. And while there are obvious challenges, it is still possible to exercise after SCI. Watch the video or read the report. Presentation time 60 minutes. After watching the video, please complete our two-minute survey. So many reasons! In addition to reducing your risk for heart disease, research in the SCI population has shown that exercise improves respiration (breathing), muscle strength, circulation, body composition, self-esteem, self-confidence, depression, anxiety, and independence. It also helps to prevent secondary complications (such as urinary tract infections, pressure ulcers, and respiratory infections), reduce the risk for diabetes, improve immune system function, and reduce constipation. 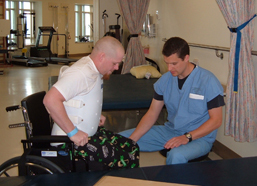 Each injury is unique, and your ability to exercise after SCI depends on the level and completeness of your injury. There are some special exercise precautions for people with SCI to be aware of. Many people with SCI have low blood pressure (BP) when they exercise because blood does not return as efficiently back up from the legs. People with more complete injuries often have more trouble with this. If your blood pressure drops, you can become lightheaded or a little queasy. Wrapping or bandaging the legs to provide vascular support. Exercise slowly at first and progress gradually to avoid sudden pressure drops. If you have an injury at T- 6 or above, you may have trouble gauging how hard you are exercising. Your heart rate and temperature may not increase as they normally would, and you may not sweat when exercising hard. You may need to find other ways to gauge how hard you are exercising (see section on Intensity, below). Make sure your exercise environment is cool and you dress in loose clothing that allows freedom of movement. Be careful with all your transfers on and off equipment and look for areas that could cause friction, pressure or shearing. Be mindful of protecting and monitoring your skin throughout whatever exercise you choose to do. Make sure you know your body's response to a stimulation that might be painful or cause irritation that could lead to AD. Be vigilant about maintaining good exercise technique to avoid repetitive motion injuries. Try not to perform only one motion or overwork one muscle in any session. Choose exercises that do not overuse muscles that you might already be using a lot during your daily activities, such as the muscles you use to push a manual wheelchair. Be mindful that spasticity may make it difficult to do an activity well or it may throw you out of position while using a machine. 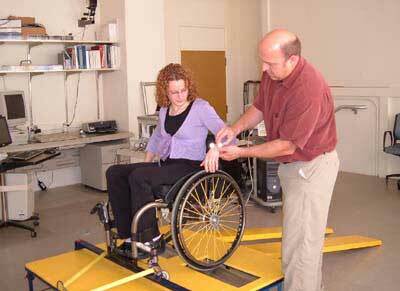 If you have a lot of spasticity, have someone with you the first time that you trial new equipment or exercises. If you are on medications that dampen your pain threshold, you may not be able to tell if an exercise is painful and possibly causing damage. Remember! Exercise should not be painful! Have a therapist or trainer check you out to make sure you are doing an exercise properly. Talk to your health care provider before engaging in a new exercise program or if you want advice about what kinds of exercise might be best for you. This is especially important before you engage in standing programs or weight-bearing activities because of the risk for fracture. Dysreflexia awareness / temperature awareness--- empty urine bag prior to exercise. Heart rate changes in tetraplegia may not show the same response as paraplegia. Exercise sessions should include short bouts of 5–10 minutes of moderate intensity alternating with active recovery periods of 5 minutes. Essentially, you want to be exercising about 5 days a week: 3–5 of those days doing aerobic or endurance exercises, and 2–3 of those days doing strengthening exercise. You can combine both types in one session. Flexibility exercises can be done daily. Be realistic. If you're doing 0 days right now, don’t jump into doing a 5-day-a-week program to start with. Start with a 1-day-a-week program and work yourself up gradually to get into the habit of exercise. Build up gradually. Start with short bouts of 5–10 minutes of activity, then switch to a lower intensity activity. Gradually increase your high intensity times. Find activities you enjoy. To be successful, you need to find activities that are accessible, affordable, and interesting enough to hold your interest over the long term. Vary your program. Don’t do the same thing every time. Varying your activities gives you more health benefit, reduces the risks for overuse injuries, and keeps you from getting bored and losing motivation. While exercising for 30 minutes 2–3 times a week is sufficient to give you aerobic or cardiovascular benefits, the ASCM recommends 30–60minutes of physical activity 3–5 days of the week. Intensity: How hard are you working? Try talking while you exercise. You need to exercise hard enough to be breathing heavily but not so hard that you can’t carry on a conversation without gasping for air. I often teach the talk test to my therapy patients, and it works very well. This method is based on the physical sensations a person experiences during physical activity, including increased heart rate, increased respiration or breathing rate, increased sweating, and muscle fatigue. 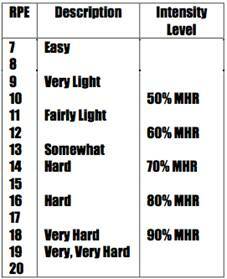 The goal is to work out hard enough to feel that you are in the “somewhat hard” category, or around level 13 in the chart below. While it is good to insert short spurts of “hard” or “very hard” exercise within your workout, you should not stay at that level (16 or above) for very long. Make sure you maintain good technique—good form—throughout your exercise. As soon as your form starts to decline, stop the movement. Otherwise you are setting yourself up for possible injury. In strengthening exercises, only do as many repetitions as you can using good form; your last repetition must be as good as the first one. Likewise, if you are doing wheelchair pushing for your endurance activity, make sure your posture and movement quality do not start to deteriorate. Stop and take a break or go on to a different movement. Your exercise program should include three components: Cardiovascular conditioning (aerobics); muscle strengthening and endurance; and flexibility/stretching. 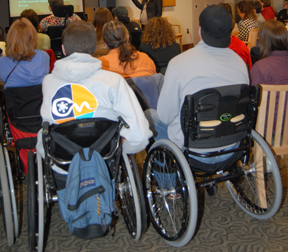 NCPAD—National Center on Health, Physical Activity and Disability (http://www.ncpad.org)— has many materials and programs on their website, including exercise videos for individuals with spinal cord injuries. SCI Total Fitness (http://scitotalfitness.com) is an online exercise and weight loss program specifically designed for people with SCI. Signing up gives you a program tailored to your needs and interests. There are different monthly fee levels based on what program components you choose. Note: You don’t need fancy equipment for most of the activities listed above. For some of them you can use your own body weight for resistance, or purchase inexpensive hand weights, cuff weights or Therabands. These can often be found in sporting goods stores or online. FES exercise delivers electrical current to the muscles via electrodes placed on the muscles of the lower limbs. This drives paralyzed muscles to perform movements that allow you to do activities like cycle or walk if you are set up on the right equipment. As your body moves, blood circulation increases and muscles strengthen, providing benefits such as improved heart health, increased endurance, improved bone density and reduced spasticity. You need access to the equipment, either through a facility or by purchasing it yourself. FES is not appropriate for everyone, depending on their level and completeness of injury. Discuss this option with your rehab health provider to see if FES might be feasible or appropriate for you. Gym-Based Exercises for SCI shows how to use gym equipment like wall weights, hand weights and machines. At-Home SCI Arm Workout shows how to use elastic bands and free weights. SCI Strengthening Program shows exercises with a variety of equipment. 3-5 sets; 10-15 reps; moderate intensity; 2-3 sessions per week. Maintain good quality of movement throughout (if you can’t, either reduce the weight or reduce the number of reps). Avoid painful positions—it should not hurt! What muscles should you strengthen? Work on muscles that balance the muscles you use all day long. For example, if you're pushing your manual wheelchair all day, you are using your biceps, pectoral (chest ), hand and wrist muscles quite a bit. For your exercise program, then, you should focus on strengthening the opposite muscles, such as the triceps (back of upper arm) and muscles of your upper back. This will help you maintain stability and avoid overuse injuries. See “Important Muscle Groups” on page two of the SCI Arm Workout [link]. For those who use a power chair, both front and back muscles need strengthening. Stretching allows you to maintain flexibility, which helps with posture, balance and activities of daily living like dressing and bathing. Think about the positions you are in all day and focus your stretching routine on those muscles that have been contracted. Held for 20-30 seconds, no bouncing! Take a deep breath and hold it for a few seconds before slowly breathing out. Take a deep breath bringing in as much air as you can and as fast as you can before pushing the air out as fast as you can. Take a deep breath and hold it, take another breath and hold it, and take one more before slowly breathing out. Take a deep breath in then breathe out counting as long and as fast as you can. If you have a spirometer, use it to both exercise and keep a measurement of your progress. What am I doing now? Whatever you are doing now, think of ways you can increase this a little. How can I do more? Think about working small chunks of activity into your daily routine. Do you push your wheelchair from the car to the office? Try parking farther away. What motivational resources can I use? Setting goals and tracking progress are good ways to maintain motivation. You can do this with a notebook or calendar, or try online resources such as My Fitness Pal (www.myfitnesspal.com) or Online Fitness Log (http://www.onlinefitnesslog.com/). There are many exercise apps available for mobile devices now, and a search may reveal apps that can work for a person with SCI. Do I have any health concerns that I need to address prior to starting an exercise program? Check with your health care provider. Your health care provider may work with other patients who are trying to increase their physical activity and may have suggestions that can work for you, too. Remember, even a little exercise has benefits and is better than nothing. You don't need to join a gym or hire a trainer, but you should try to do something. Be patient; it may take some time and trial and error before you settle on what works for you. Click here to see more SCI Forum videos.